Two magnificent houses with some of the most spectacular views on offer in the west of Ireland are being offered for sale by Kirrane Auctioneering. With unrivalled views over Galway Bay and the surrounding coastline across to the Clare Hills and westward to the Aran Islands, the total area of the site is .17 hectares and the zoning is currently village core under the Barna Local Area Plan. Agents describe the sale as "a once in a lifetime opportunity" for properties of this quality and location. "The site offers unlimited potential to an entrepreneurial purchaser to continue and expand the bed and breakfast business while deriving substantial income from the adjoining property, amalgamate both properties to develop a hotel, or provide a commercial and residential development on the site." 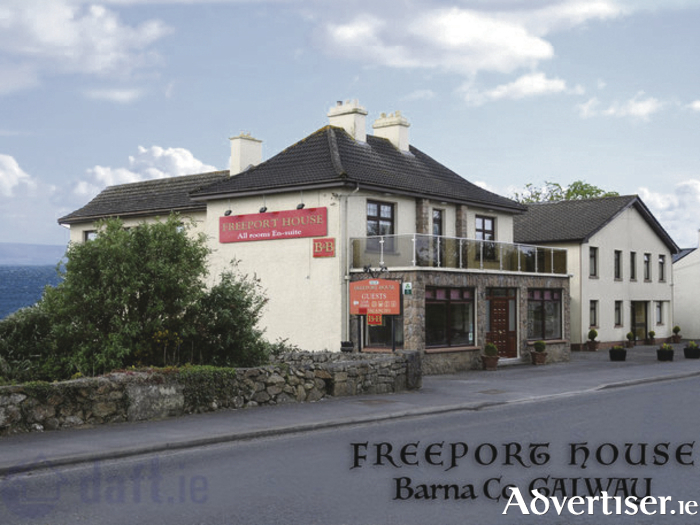 Freeport House Bed And Breakfast is a well established business with returning clientele from all over the world. The property offers location, comfort and luxury, and comprises a large entrance foyer complete with seating and a reading area leading to the hallway and reception. On the left is a large sitting room, a half bathroom with toilet and wash hand basin, full bathroom with power shower toilet and wash hand basin, breakfast room, double en suite bedroom with built in wardrobes, kitchen, utility and large dining room with seating for 20 people. Upstairs there are seven en suite bedrooms, main bathroom with bath, shower, toilet and wash hand basin, store room and linen press. There are two heating systems, a Stanley oil fired system and an oil boiler system. The outside boasts tarmacadam front and rear, with a large rear car park. There is a wide variety of restaurants, beaches, golf clubs, sporting and water based facilities in the immediate vicinity. Floor area c4,600sqft; Ber D2 Cert No109757112. The second property is laid out in three self contained apartments with uninterrupted views over Galway Bay and the Clare Hills. Each apartment has three bedrooms, a kitchen/dining room/sitting room and a bathroom with shower, toilet and wash hand basin. There is tarmacadam to the front and rear of the house with a store and utility to the rear. Floor Area c2,900sqft; Ber C3 Cert No 106132368; Ber E1 Cert No 106132368. Contact the sole selling agents APP Kirrane Auctioneering 16b Sandyford Business Centre, Bohermore, Galway, 091-705669 or contact Gerry 089-2548533.